Comments: Comments Off on The trade for Love is a test for GM Griffin. The trade for Love is a test for GM Griffin. Browns Season Simulation Monday on NNR. Please join us at 6 PM EDT on or https://fryingpansports.com/radio-show/. Make no mistake about it. LeBron James is testing his new GM David Griffin to get Kevin Love. If Griffin fails the test LeBron “could” consider opting out after his first or second year. That does not mean he will leave Cleveland, but it does mean that this test will determine if Griffin is still the GM in 2015-16 season. There is no question that LeBron coming back to the Cavs is the best news Cleveland sports fans have had since the Browns drafted Jim Brown. In my opinion Love will not sign a long term deal with any team except the Cavs. Like Cavs fans, Love is sick to death of losing and wants to win. The best chance to do that is in Cleveland with LeBron and Kyrie Irving. If teams see Love as a rental, his trade value will decrease significantly. For example Golden State is not likely to give up SG Klay Thompson to get Love for a year. But the question is will the Cavs be willing to wait to make a deal for Love? I believe that by waiting, the Cavs can get Love for a deal that does not include Andrew Wiggins. The pressure to do something with Love will grow on the Timberkitties as the days pass. He will walk away at the end of the season and the team gets nothing for him. Since he is their only valuable asset, they can not afford to let him walk. However, I do not think Griffin can stand the heat and he will make a deal that includes Wiggins. While that is not a bad deal, the Cavs need to prove to LeBron that they are willing to do what is necessary to get him the help he wants. He left in 2010 because the team was unable to bring in talent to help him win. What many Cav fans do not know is LeBron did his best to try to recruit talent to join him in Cleveland prior to the decision. He is now working hard to get Love to join him. Another question is can new head coach David Blatt find a way to utilize a big man? I suspect he will. Mike “Mr. Potatohead” Brown never could figure out how to use one. The last question is can the Cavs win a title with LeBron, Love and Irving? I believe they can. Will Wiggins develop? Yes but the question is how many more games will the Cavs win next season with Love? LeBron is testing Griffin and the Cavs. The team had better pass. Comments: Comments Off on Can the Cavs get LeBron James to come home? Can the Cavs get LeBron James to come home? There are a number of questions that have to be answered before I can address the one everyone in Cleveland wants to know. Where do the Cavs stand after the 2014 draft? way that UFA SF Luol Deng resigns. That leaves a hole the size of the Grand Canyon in the starting lineup. C Anderson Varejao can’t stay healthy and back up C Spencer Hawes is a UFA and likely to leave if he gets a decent offer. If Blatt can solve the issues, the first overall pick Andrew Wiggins will help make the team a playoff contender. However, even in the weak Eastern conference the Cavs are a 5th or 6th seed. There is no way they can win a playoff series against the top teams. Where might LeBron be interested in going? In my opinion LeBron will not go anywhere except back to Miami or to Cleveland. Most of the teams that have 2 stars already are in the West. He won’t go to the West because the path to the finals is much easier in the East. Also he will look like a mercenary going to a 3rd team just because he lost to the Spurs. By staying in Miami and taking less in salary, he looks like a team guy. By going back to Cleveland he looks like a hero going to save his home town team. What do the Cavs have to do to get LeBron to even think about coming back? About the only thing that will get LeBron to consider coming back would be to bring a super-star vet to join point guard Kyrie Irving. All the conversation around the Cavs has just one option—trading for PF Kevin Love. Landing Love would definitely catch the attention of LeBron. But there are issues with that concept. First, Love will be costly in terms of talent and assets to get him. It would likely cost the Cavs Wiggins, SG Dion Waiters, PF Tristan Thompson and 2 future Cavs 1st round picks. Given that there is just 1 year left on Love’s contract, that would gut the Cavs and their future for the chance that LeBron would come. Second, Love will only sign an extension with the Cavs if LeBron is in Cleveland. 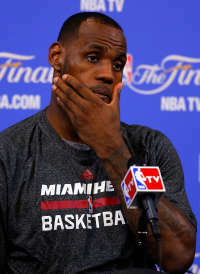 If LeBron goes back to Miami, Love will leave after 2014-15 season and the Cavs will be back in the lottery from now on. Is there an alternative that might catch LeBron’s interest? There are some alternatives but you have to wait for tomorrow’s posting to find out what they are.